New Triple Exposure galleries online! New galleries of some of the top shots taken by the Triple Exposure young photographers are now available online. ‘Ana beheb Nablus’ (I love Nablus). 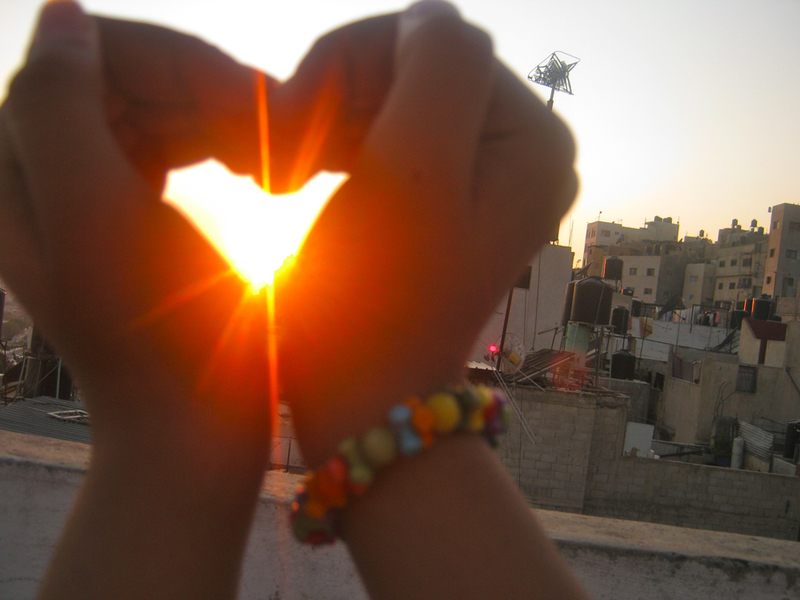 By Shahd, age 15, from El Ein refugee camp, Nablus. A sample from these collections is also viewable on the news site Palestine Monitor. 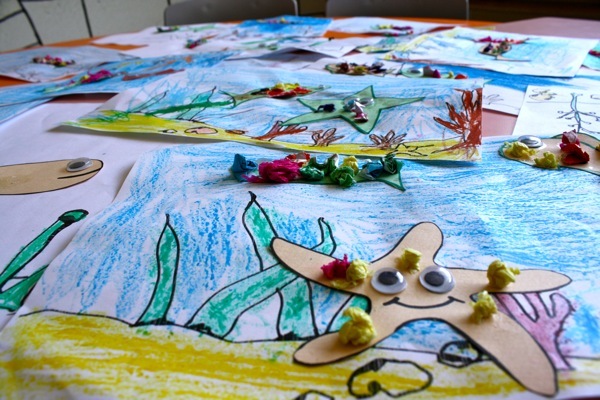 The second week of our Ramadan arts course revolved around the theme of nature – from the sea, to the land, to the sky. We asked the kids, ages 4 and 5, to demonstrate how plants grow. And they showed us step by step – digging the hole, planting the seed, adding water and the rays of the sun, sprouting and slowly growing till we all were trees swaying in the breeze, arms aloft. We then put these ideas into action, planting flowers along the entrance of the TYO center. 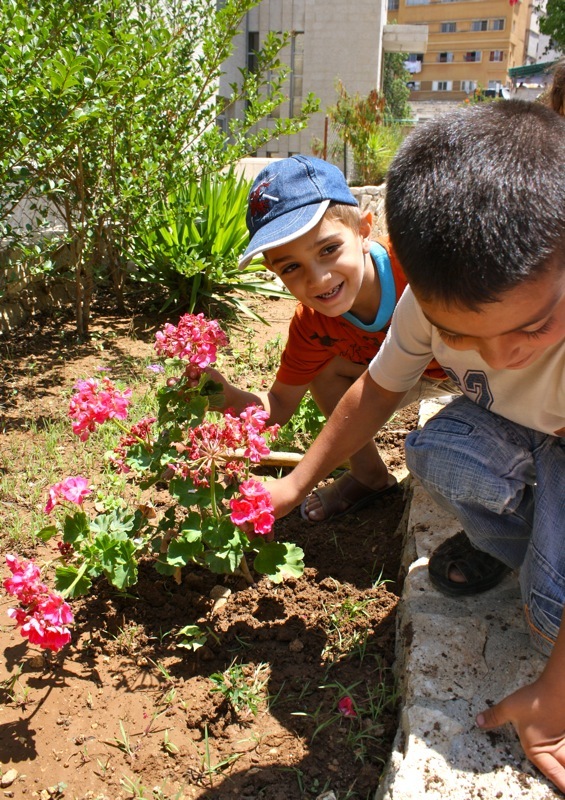 The children loved digging about and watering the plants, seeing their efforts leave something beautiful to brighten up the way into TYO for everyone that comes here. The houses and multi-story apartments in this neighbourhood (Khallet al-Amood) are built close together, rising vertically up the hillside, with unforgiving steps replacing streets between the densely populated homes. Thanks both to the geography and to urban planning, they rarely have gardens, so a flower-planting activity is a great opportunity for the kids to get their hands dirty, learn a little more about nature and see how we can brighten up even inner city environments. The next day we moved onto painting. 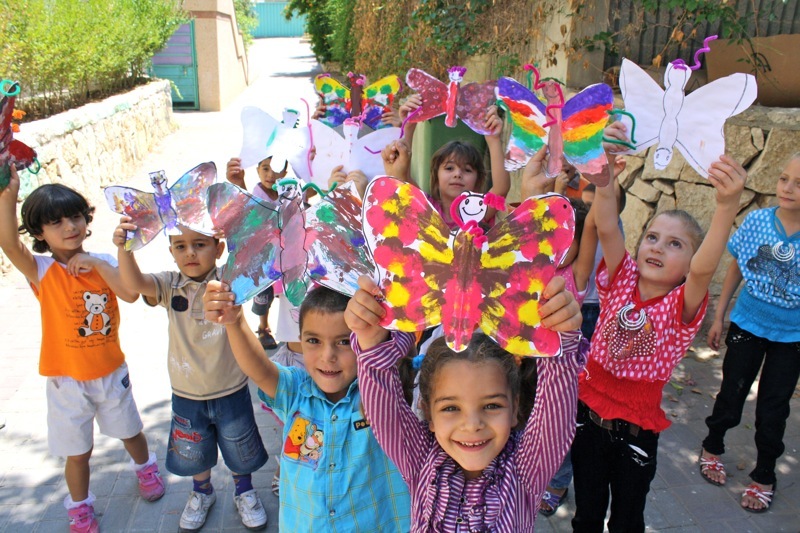 After some butterfly themed stories and games with core teachers Jawad and Haitham, the children painted half a butterfly, folding it in half to print the same colourful pattern on the opposite wing. Each symmetrical creation was unique, bringing joy to the kids as they saw through each step to make their own butterflies and take them home to show all the family. The activity in my arts and crafts class was simple; to write and/or draw a picture about your favorite memory from these past two and half months. As I saw my students writing about the time we made paper lamps for Ramadan, new friends, water balloons, and pool day, I couldn’t help but reflect on how important this experience has been to me and how I just can’t seem to shake the perpetual pit I’ve had in my stomach about leaving so soon. Nearly three months ago I said goodbye to my family and boarded a plane with a certain amount of excitement and trepidation for a new and often misunderstood place, a new adventure. Although I had never been to the Middle East, I immediately feel in love with the resilient and vibrant spirit of the Nabulsi people. From the first week onwards, life has moved at an extraordinarily fast pace with little time to process. But in this short time I have seen my students take leaps and bounds in developing their confidence and personality. One student, Aya, came into class the first two weeks and sat down with her head on the table. She was silent, upset, and refused to participate in many of the activities. Eight weeks later, I am bound to find Aya attached at the hips of a new group of girlfriends from a different neighborhood, coming to class early to practice her numbers in English with me, and standing in front of her peers to present her art projects with a shy but steady smile. What is even more encouraging is that Aya’s story does not stand by itself but is representative of TYO’s impact on the children who participate in its programs. Throughout these 8 weeks, I have heard similar stories repeated time and time again from my other interns; it’s one song I will never get sick of listening to. My students and the intern program has challenged me to grown in new ways both personally and professionally. The lessons learned, stories I have had the privilege to hear, and experiences I have shared with my fellow interns will stay with me wherever I go. Until I’m back in Nablus…ma’a salama. The TYO mural class have completed the seventeenth Triple Exposure mural in Nablus. Across three visits to the school, mural teacher Rimah and her volunteers worked with the team of twelve students, ages ten to twelve, to finish this large mural on the external wall of the school for all to see. Highlighting the importance of creative play as a part of a holistic education, the book in the centre reads ‘My right to play’. The book symbolizes learning and communication, and the sunset landscape, the undeniable beauty of Palestine. Triple Exposure mural teacher Rimah and her volunteers went to visit the boys’ school in Askar UNRWA refugee camp, Nablus. Over two visits she worked with fifteen boys, ages 10-11 on two murals in the hallways of the school. Whilst representing the themes of nature and school, these murals have a more kaleidoscopic feel to them, with unexpected colours inside the branches and leaves of the tree, really bringing an extra splash of colour to the walls of Askar. Like many schools in the West Bank, the school doesn’t have an art teacher or art department, and these were the first murals ever in the school. Even the teachers were interested in how the different colours were mixed and applied. The director of the school liked the mural so much he has asked Rimah to come back and do one more any time. After they had finished the murals, the boys wanted to go home and show their parents they had been working with paint, and thoroughly enjoyed drawing moustaches on each other. The boys showed so much talent and dedication, seeing the project through to completion with admirable focus. If they had an art teacher or more opportunities to practice, the kids could really work on their art skills and creative thinking, on top of making these vibrant and lasting contributions to their community. To date, Triple Exposure has complete fifteen murals around Nablus. For more details, please see the Triple Exposure blog. The Triple Exposure mural class were busy painting during June and have brightened up a hallway in UNRWA Nablus Basic School. The students worked together in class to come up with ideas of how to protect the environment, and images that they could create to represent these. They personified the environment as the sun and the water droplet, and showed that if we leave taps running we are wasting a precious resource, and if we pollute the skies we ultimately damage ourselves. The earth represents the one planet we all share. After painting their designs onto hardwood, the art work was then installed in the school. On Thursday, mural teacher Rimah took the students to view their painting, and both the students and the school were delighted with the finished piece. Portraits of kids, by kids: presenting the faces and voices of Nabulsi youth to the world. The best way to let the children of Nablus try out digital photography is to take the cameras to them. So June saw the start of our new Triple Exposure workshop – Notes from Nablus. Our first location was Balata UNRWA refugee camp. After some Q&A on portraits and basic tips on composition we went over how to use the DSLR cameras – as it was the first time for the nine to eleven year olds, we kept it simple by talking about how to use the viewfinder, zoom, flash and how to hold the camera. Everyone made colourful name cards and took each others’ portraits to practice taking shots. On day two we started by discussing what Nablus means to us. The children talked about what they love about Nablus, and what they would change if they could. They then brainstormed in groups and presented what they’re most proud of about their city/country, and how they would improve it if they were in charge. The levels of political and historical consciousness were impressive despite the young age of the participants. Finally, we asked the children to each choose a short message to send out to the world from Balata/Nablus/Palestine. After writing the messages on each others’ hands, they took each others’ portraits once again and came up with this series of wonderful portraits which give voice to the children of Balata. Please see the Notes from Nablus gallery for more photos.